Den's Got The Runs: Run for Fun and Maureen Mo Virtue. Its Friday afternoon and I'm drinking a large amount of coffee with the wife and our host Mo Virtue. We've been here in the Borders for an hour or so. Mo and I are looking forward to this weekends running. We both have signed up for the Full Marathon on the Sunday. Mo required some persuasion, which I happily helped out with. As the wife and I were coming up to have a holiday. I decided to run the 10k on the Saturday to. Mo had other plans. Mainly being the poster girl for next years event!! I guess my invite went missing? Bloody Royal Mail. Let me tell you a little bit about Mo, and just as importantly Run for Fun (RFF). Back in October 2011, I received an email from the Great Run organisers inviting me to enter the Ballot for the very first run in the newly built Olympic Park and Stadium. An opportunity I took up. At the beginning of November, I received another email confirming my successful place into the 5 mile run. I was going to be one of the first 5,000 people to run in the London 2012 Olympic Stadium in March!! Result. The event was being organised by the Great Run Organisation, on behalf of the National Lottery, for whom had donated a large amount of money for the Olympic Park to be built. The run was The National Lottery Olympic Park Run. There was also a Facebook page, naturally. With all the excitement of gaining entry, people were chatting about the event on this page. Somewhere also chatting was Mo. But Mo had an idea. I may be wrong, not for the first time in my life, but I think Mo could see what could happen. After the event people may not chat anymore. So Mo put her idea into practice. She set up a little Facebook page called Run for Fun. She invited some of us into her group. A group on a Facebook page which was a closed group. You needed to be invited in or ask to come in. But it wasn't and isn't an exclusive club. Its Mo's way of looking after the people. I quickly asked if I could come in, I brought wine? After a secret handshake that never happened, I was in. I was now part of what has become amazing. The few months building up to the event, we would all chat and start to get to know each other. Mo seemingly having the ability to comment on all threads. The majority of the group, which at this early point was about 40-50 people, most doing the Olympic Park Run (OPR). The day arrived in late March for us all to head towards Stratford, London from all over the country. We were off to make history. No other Olympic Stadium had held an event like this before the Olympic Games. We had all arranged to meet as close to the Orbit within the Olympic Park as we could. Some of us had swapped numbers. The wife, my mother and myself were just outside Costa coffee in the Westfield development, when i tried to ring Mo. She was just in side! With Coffees in hand we met first time face to face and hit it off straight away. This first event was a great success for RFF. A large group of us did meet and had a group piccy taken. After the event, the talk on the page was of the race and what the next challenges would be. Friends started adding there running friends, who in turn added there friends. The group was growing. A mix of first time runners and seasoned runners. Mo some how still managed to comment on every thread. Fuelled by coffee. I became aware that more and more people were trying to meet up at races. But it was difficult. Trying to recognise people from there Facebook Profile. If that in fact was them in the picture. So I discussed with Mo the idea of running tops. A bit of work was done and Mo was keen to have a big smiley in the design, we came up with the first version of the RFF symbol and shirts. I located a manufacturer, and set about the huge task of offering people the chance to have a top, in there chosen colour and with or without there names on the front. These were a great success. We now have a way to recognise each other at races. The shirts/vests/hoodies were a great success. 180 odd were made. Mo now also takes on the mammoth task of doing the tops. I honestly don't know how Mo does it?! She also runs a B&B, has a beautiful daughter,Georgia, and a wonderful husband, David. Run for Fun was also setup while Mo wasn't in her family home. After suffering a fire. She was also recovering from Pneumonia!! Mo is highly supportive and inspirational. Dishing out advice and cyber hugs. I'm privileged to call her my friend. 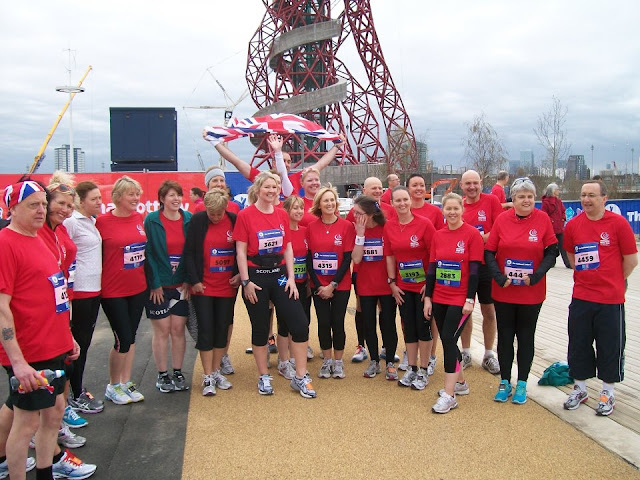 RFF has gone from strength to strength since that first race at the London 2012 Olympic Stadium. We celebrated a year of RFF with an anniversary run. We signed up to run 5 miles, anywhere. Be it an organised event or just with friends. All you had to do was register with Mo, plus a small cost to cover Medal. Then you just had to run 5 miles on the 31st March. The medal is fantastic and unique, with our mascot Rufus on the front. We had a similar Christmas event. We are also doing a Run the World event. Where from Jan 2013 to end of Nov 2013 we record our running mileage. We then inform Mo of our monthly mileage and Mo plots our Journey around the world. We have already completed one loop!! Again, we will receive a medal for this. A great reward for those training miles. At Edinburgh this year, we got to unveil the first proper RFF banner, pictured at the top of this Blog!! If you don't spot a RFF shirt, then look out for this banner! It brings a smile to the most suffering of runners! Run for Fun is now well over 600 members strong, all of them running stars in their own right! Over 65 members will be running the National Lottery Anniversary Olympic Park Run in July! A true Olympic Legacy!! Mo will be there, fuelled on coffee, to spur and inspire us all onto 5 mile PBs!! Run for Funners, Thank you too! 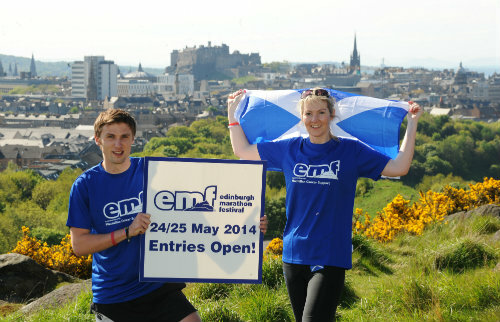 Mo, the Poster girl for EMF 2014! !